Everyone loves a deal and offering specials or deals is a great way for your business to attract new customers and get repeat customers year after year. WebReserv is excited to offer a new feature where you can advertise your deals and specials on your listing page on WebReserv. 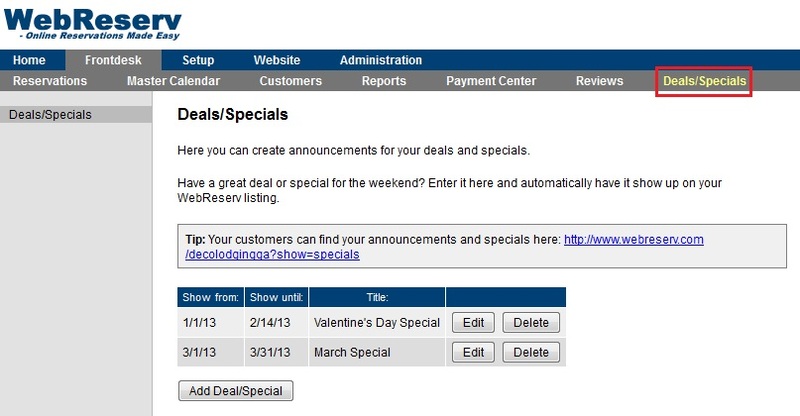 Add the deal or special by creating an announcement in your account. Follow the simple instructions below. Log into your WebReserv Account. Go to Frontdesk – Deals/Specials. This entry was posted in Discounts, General, New Features and tagged offer deals and special on webreserv, offereing special deals, offering deals and specials, webreserv deals and special.